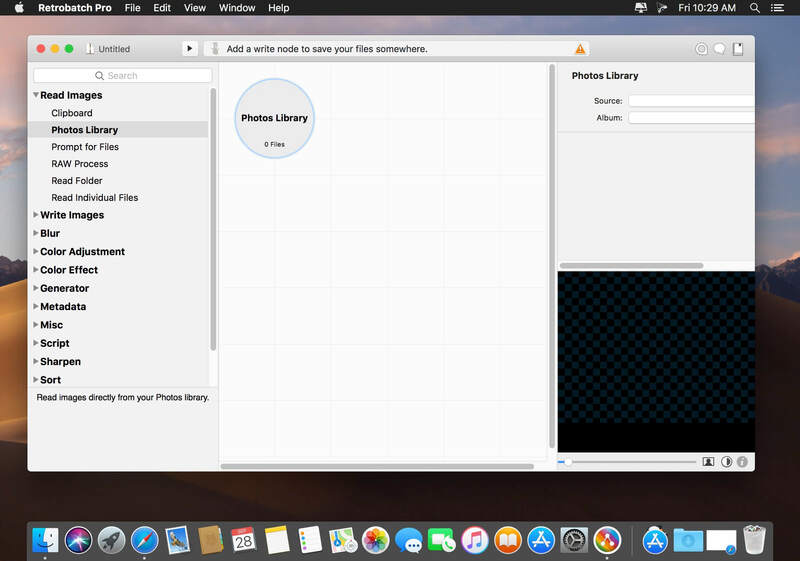 Flexible, super charged, batch image processing for your Mac. … A node based batch image processor means you can mix, match, and combine different operations together to make the perfect workflow. … Convert PSD files to HEIC, JPEG, PDF, PNG, or TIFF. A node based batch image processor means you can mix, match, and combine different operations together to make the perfect workflow. A node for every operation, from changing DPI to rotation to Machine Learning to custom behaviors with AppleScript. Optimize your images for fast delivery over the Internet. 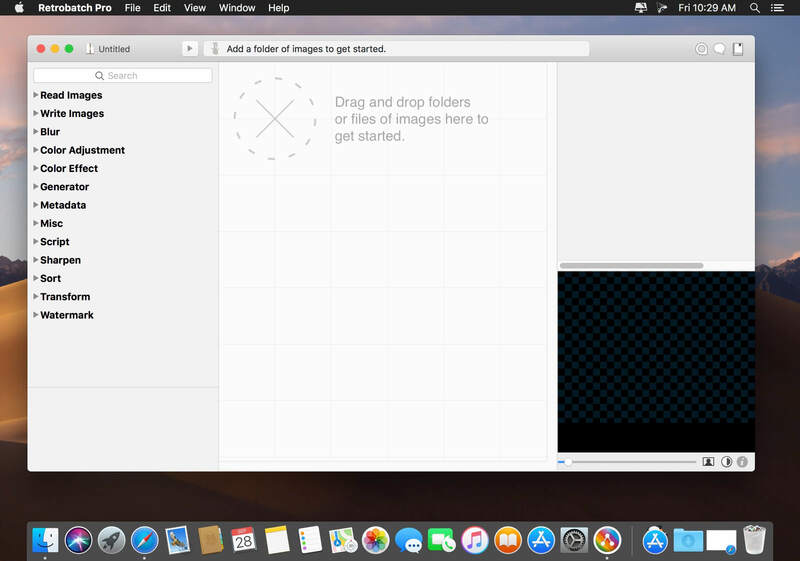 New Animated Image node, which will allow you to make animated GIF or PNGs. Droplet support! Use the File ▸ Save As Droplet… menu item to write out your workflow as an application, which you can then drag and drop folders and images on to run your workflow. To re-edit a workflow contained in a droplet, you can either hold down the Option key when opening the droplet, or drag and drop the droplet onto the Retrobatch app icon. New Set Finder Tags node, which can assign one or more tags to images in the Finder (Pro only). This will work on the image that was most recently written- so you don't need to write out a copy of an image to set it. You can instead have a Read node, and then a Set Finder Tags right after it and Retrobatch will then set the tags on the original files. It will now notice when a new image shows up on the clipboard, and update the preview accordingly. If you copy a file in the Finder, it'll now use that file on disk to process through any following nodes. New preferences for sending out a notificaiton when a workflow ends, as well as playing a sound. The Watermark node now has a "File Number" token, which is the image number being processed. The Shell Script node has a new field where you can enter arguments to the selected script. Arguments are separated by spaces. New "Limit" node which will limit the number of images or PDFs allowed to pass through (Pro only). New option for the Write Images node, which enables to you write your processed images back to the original image it came from. New template "Classify and Set Keywords" which uses Machine Learning to figure out what's in the image, and sets the metadata keyword based on what it found. New "Page Number" rule in the Rules Node. You can use this rule to say "only let the first page of a PDF through", or "all pages of an animated GIF except the first", or even limit images 5 though 16. You can now write and distribute custom nodes in jаvascript using a new Plug-In API. This feature is currently in beta, and we're hoping to finalize it in a future release. But it's already incredibly useful today. If you have questions or ideas, head on over to the forums to ask about them and don't forget to read a short introduction on how to create one. In addition, the CocoaScript bridge has been replaced with FMJS. No changes to current scripts should be needed. Fixed some problems previewing images created from the clipboard. Fixed a problem when changing the DPI of PNG images when no new image bits were written (just metadata changes). 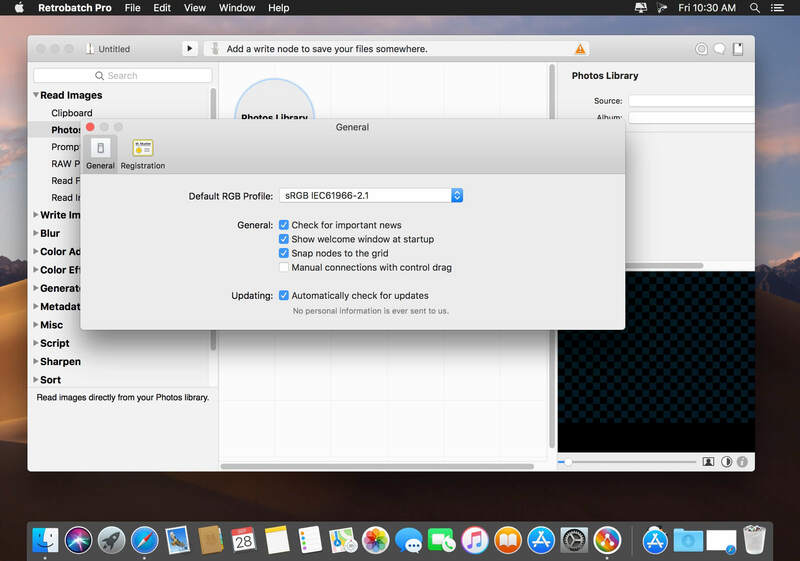 Fixed a problem where using Automator to run a workflow wouldn't always process images through all the connected nodes. You can now rename RAW files without having to re-encode them with the write node, as long as there are no changes to the pixels made in the image. Fixed a problem where you couldn't select PDF files along with images from a couple of Open panels. Squircle instead of circles for the node shapes on the canvas. Retrobatch is now notarized from Apple. We're not sure what this does for you, but your Mac would eventually complain if we hadn't. Hurray!